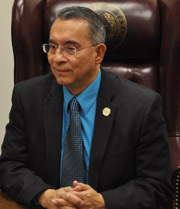 The following interview with Texas State Representative Raul Torres is one of a series of interviews conducted by VOCES Action and TexasGOPVote with members of the Hispanic Republican Conference in the 82nd session of the Texas Legislature. Rep. Torres represents District 33 which encompasses the heart of Corpus Christi and Nueces County, from Greenwood Drive to the west to Laguna Shores Drive to the east. The topics we discussed included Hispanics and Republicans, the district he represents, the Appropriations Committee of the Texas House, his ideas with regard to efficiency and the application of the six-sigma principles to improve efficiency in government, HB3149, and being a bilingual Hispanic. I greatly enjoyed learning about the six sigma and how HB3149 identifies the issue or works toward addressing and fixing the issue of wasteful government. I also enjoyed learning about how Mr. Torres "re-learned" Spanish by reading his Bible in Spanish. Adryana Boyne: As a Hispanic and through my work with VOCES Action and meeting with thousands of Hispanics, I know that Hispanics have conservative values, and I know that you identify also with that, and I would like to know if you can share the ways that you have observed this among Americans of Hispanic background? Raul Torres: Well let's just go over a couple, two or three of them, that I've seen that I think we can all agree are conservative values. One would be family, pro-family. These values are embedded in the Hispanic culture. One of things I remember as a young man growing up with my mother, single parent, was that she always that family was very important, and I see that in our community. Whether they are financially well off or economically challenged, we find families coming together because that's the unit that keeps them feeling good about themselves. In schools, we see families working together in the work places. I know, I myself, have a policy, family comes first, regardless of anything else because if the family is not right, the employee will not do well at work. If the family is not right, the children will not do well in school. So it does affect our culture. Back to the family would be the pro-life issue. Whether you believe or accept the fact that abortion is legal, it is legal, but Hispanics tend to believe that family is very important, and for many of them, abortion is a very challenging issue for them, and so many of them believe that the sanctity of life is of key importance, and so they believe in that, and they go to church and they pray and the bind together with other people of like kind. So we have the family values, which are embedded in our culture everyday, life and work, and also the pro-life value. Another type of conservative values that we find in Hispanics is that they believe in the work ethic. That means they're not afraid to go to work, they're not afraid to put in a long day's worth of work. My mom had three jobs at one time. I didn't understand when I was a little boy, but I understand it since I've grown up. The importance for her to provide for her family, and that culture does that, and I still did so well, and people that come across as immigrants, across from whatever country they're from, whether it be Pakistan, India, Central America, or from Mexico or Canada, they work very hard to do well when they're here. So they have that work ethic that I think is very strong in especially Hispanic values. So those two items are good examples of what I see everyday in the community where I live. Adryana Boyne: Corpus Christi and Nueces County are turning Republican, as we have seen in the last election, tell us more about that trend, and what you are seeing in your district. Raul Torres: Well the reason I believe that trend is happening is because people are becoming number one, more educated, and because of that, the old approach, the palenque, no longer applies to a lot of people, they're independent thinkers, they're either independent voters, or they're changing their value processing and how they look at life. They're beginning to see that they don't need to depend on government for a lot of their own decision making, or someone to tell them how to do things. They're going to college, they're raising a family, and they believe in the power of their own personal abilities to make things happen in their communities. So I think that's what has transformed Nueces County. That plus people like myself who have gone into the community and have said you don't have to let someone else do your thinking, you can think for yourself, and all we ask is for you to think for yourself. Look at what we're saying, and then you decide what's best for you and your family, and people are responding to that, and we're seeing that trend in Nueces County. Adryana Boyne: As a freshman Representative on the Appropriations Committee and looking at the Appropriations Process, do you think the leadership is serious about government reform and efficiency? Raul Torres: In one respect, yes. They've talked about all the things they've done in the past 15-20 years, for example, the Sunset Bill, which every biennium the government looks at certain agencies, and they do an examination of them and decide whether or not that agency should continue to exist in our government. I think that's a great way to begin that process. It has been working very well for us, but the other way doesn't go far enough. I believe there is still much more work to be done, and I personally believe government is too big, which means it's top heavy, and I believe we can streamline it, we can make it more efficient, and make it work better for the people of Texas. So, I want to say yes, they do work very hard at it from the Appropriations side, but on the other side no, because I think there is still more room to be able to work with that. Adryana Boyne: What are your ideas with regard to efficiency and the application of the six-sigma principles to improve efficiency in government? Tell us about HB3149. Raul Torres: HB3149 is pretty much the pinnacle of our legislative agenda. The voters send us here to Austin for three things, they asked us to do three things, and we won on this platform. They asked us to not raise taxes and balance the budget, they asked us to eliminate wasteful spending in government, rethink how government works, and they asked us to do what we can to create jobs in Texas. That was the mandate. We have been able to identify legislation that will address those three issues. HB3149 identifies the issue or works toward the issue of wasteful government spending. Every organization has waste, and I define waste as being a cost in the process of delivering that service or product that does not need to be there. So, HB3149, when I learned about that methodology, I was very excited, and as me and my legislative staff looked into it, we got really excited and thought maybe this was the answer that government needed to address. So we did more examination. We talked to the originator, or the founder of the Lean Six-Sigma, who put it all together, and so as we talked to him, we talked to the city manager from Irving, Tommy Gonzales, we had the pleasure to meet with the workforce commissioner of the state of Utah who came down as well to speak on the behalf of that type of legislation. In every case, federal, state, and local government, in every case, each one of them, has found significant savings to their programs. I'll give you a very small example from the city manager of Irving. He spent $100,000 in implementing the process, but they have now saved in two years , I believe, $20 million dollars in expenditures. So their budget dropped from $188 million in a city budget down to a $168 million dollars in the budget with less staff and the services it provides had more efficient and much more acceptable to the citizens of Irving, according to the testimony we heard. That is phenomenal. The Department in Defense is saving tens of billions of dollars because Secretary Gates has said that the process is what drives those savings. We don't see it in the budget because he turns around and spends that money on additional equipment and needs for the military, which is good because we don't have to continue to raise taxes. Then of course, the commissioner from the state of Utah talked about the savings that they are experiencing in Utah as she expands the program throughout a range of departments. So without question, the evidence is there, this isn't theory, this is proven science in the workplace, in government. If you want to look further into the corporate world, we find companies like Apple Computers, we find Xerox, Caterpillar, Ford Motor Company, Motorola, major industries have used and implemented this methodology into workplace practices, and they're creating better products at a lower cost, which saves the consumer money at the end of the day. That's why I believe government should seriously think about looking into this, and that's why we did HB3149. Adryana Boyne: You and I have spoken before. I believe as an immigrant myself that everyone should speak English. One of the reasons I got excited when you were elected was the fact that you are one of few Republicans that is able to speak in Spanish. You are aware that in Texas, there is a large amount of people who speak Spanish. I know that you have been able to use Spanish. Do you think Spanish is a good tool here in Texas for outreach and to educate some of the Texans who still speak Spanish and feel that they can be informed better in that language? Raul Torres: Yes, I think it's a big benefit. Anytime, you're multi-language capable, you add an extra dimension that most people don't have. When I was a little boy, through third grade, I didn't speak English, but then when I moved across the boundaries and went to a new elementary school, they didn't speak Spanish there like they did in the prior one. So I had to immerse myself in English very quickly and learn the language. Then I lost the Spanish. Then when I was around 25, I decided to worship with a Spanish-speaking Congregation, even though I didn't understand, and once I became a Christian, my brother said we could really use your help. I said I don't speak Spanish, well he said you need to learn it. So what I did was taught it to myself. I learned Spanish with the Bible like Abraham Lincoln, but in my case, the Bible was in Spanish, and I taught myself how to read it, how to write it, and how to speak it. I'm not proficient according to some other people's standards, but I get by, and I get my message across. I think that skill has helped me in my professional career, it has helped me in my public career, and it's helped me be able to better understand not only how I think and why I think the way I think, but better understand why other people think. It does come with the culture, different things come with the language, so it's helped me a lot, and I would encourage everybody, if you have some time you can set aside, learn the language, it can only help you. It can never hurt you. I just realized this is a series of interviews that Adryana Boyne is doing from the capitol in. This one with Rep. Torres is also excellent. How many people she will do in this series? I learned a lot about six sigma principles from Mr Torres and that this is the first time we have Hispanics serving in the House of Representatives in a long time! Thank you Adryana Boyne of Voces and to Texas GOP Vote for introducing these leaders to the community! Glad you like them! Check back around noon for the rest of this week and the upcoming weeks - stay tuned!